Six polling stations were set up in Russia for Ukrainians who wanted to take part in the presidential election. As Ukrainians went to the polls to elect a new president on May 25, Ukrainian expats living in Russia had the opportunity cast their ballots as well. Six polling stations were set up across the country for Ukrainians living in Russia – at the Ukrainian Embassy in Moscow as well as at Ukrainian consulates in St. Petersburg, Nizhny Novgorod, Yekaterinburg, Novosibirsk and Rostov-on-Don. Security in Moscow was tight. The street leading to the 18th-century embassy building in the city center was blocked off. Only pedestrians were allowed to approach the building, and they had to pass through a metal detector. Police officers checked all liquids and other suspicious items by hand. Those who wanted to cast their votes on Sunday had to register in advance. This extra step resulted in less waiting at the embassy, compared with previous elections. Some of those waiting to vote were wearing the traditional Ukrainian shirt, the vyshyvanka. The voters represent a wide range of Ukrainian cities. One young woman with two children dressed in vyshyvanka said that she lives in Moscow but is originally from Crimea. She said she would not be applying for Russian citizenship. “No, I am living in Moscow for family reasons, but I remain a Ukrainian citizen and want to return back to Ukraine. Only now I don't even know where to,” she said. 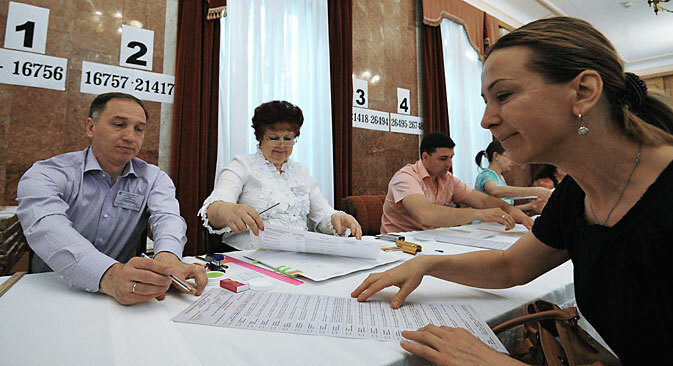 A native of Donetsk said that he was casting his vote for those at home who were unable to. “My parents still live there and they are unable to vote. As you know, those armed people made voting in Donetsk impossible. So may parents asked me to vote on their behalf too, symbolically speaking,” the man said.